Founded by clinicians, Wren Healthcare is a new company that provides clinical homecare across a broad spectrum of therapy areas. The CQC registered team employs specialist homecare nurses delivering treatment and educational support for patients and clinicians. I’ll let Iain Campbell, Wren’s Director of Nursing, explain better: “Increasingly patients are treated for diseases via targeted therapy in the home – we realise there is a lack of skilled nurses to support administration and education. Our clinical team works collaboratively with the pharmaceutical and healthcare industry to support patients within the home with their chosen treatments. We offer a range of clinical services from complex medication administration to undertaking patient support programs. "Wren Healthcare also works with the pharmaceutical industry conducting homecare visits to patients participating in clinical trials. Our Home Trial Support service increases retention and participation in clinical trials while also providing a positive patient experience by reducing the burden of sites visits for patients and their families. What Wren Healthcare is hoping to capitalise on is a significant shift away from treating patients in clinics and hospitals to homecare. The NHS 10 Year Plan is predicting the expansion of community health teams under new national standards to provide support to people in their own homes. However, that shift requires proper reporting and integration between new providers like Wren, GP practices and pharmaceutical companies. What Wren required to win contracts was a software system that could securely pull and push records from different systems. Wren’s nurses can now use Vision Community to create a record of their patient’s requirements, record face-to-face consultations and episodes of care. A patients whole treatment journey is captured and can be reported on so changes can be quickly monitored. As the records are in one place and electronically available to the nurse visiting the patient, there are no gaps in care. This is especially useful if two nurses are required as well as recording the patient’s availability. These can often be missed when relying on different systems and paper notes. The reporting of outcomes is required by the pharmaceutical companies and this will be automatically collated by Vision Community for each new treatment. Included in Vision Community is a Caseload Manager that can balance the caseload of health workers based on the number of patients, their complexity and geographic location. This enables the system to work out the optimal work pattern and distribution of patients. 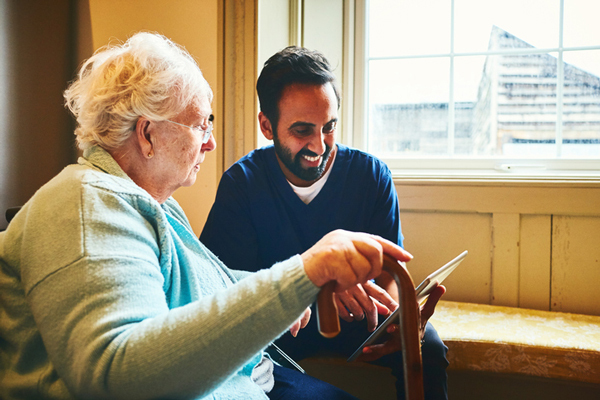 Where patient’s homes have poor connectivity, Vision Community can be used offline as well as being tethered to mobile devices. This same approach can help nurses delivering wound care or be used by organisations like Macmillan nurses. Iain explained: “Vision is fantastic. I previously worked in clinical education and project management. I worked with lots of clinical systems and always had to create bespoke approaches because of the lack of interoperability between patient records. It wasn’t until we spoke to Vision that we realised that there was a way of working with other primary care record systems with just one system. “There is going to be a huge shift to home care across the NHS and Vision seems to be the only company that realises what is needed. There are going to be more and more smaller providers like Wren and they are going to need to push and pull information from patient records on multiple different systems. When we spoke to other suppliers you could see they just saw what we were asking to do as a hindrance. “The huge difference with Vision is it was willing to help us deliver our innovation and create bespoke services. Vision is actually interested in meeting its clients’ needs. For more information about how Vision Community can streamline home care for your organisation please email me.